A smooth, full-bodied roast with buttery, chocolate hints. Peaberry is the champagne of Kona Coffee. It comes from a rarely-formed coffee bean. Usually, one coffee cherry holds two flat beans, but in the extraordinary case of peaberry only one round seed is produced. Like all of our 100% Kona coffee, our peaberry has low acidity. A smooth, full-bodied roast with a complex, sweet, citrus flavor with buttery, chocolate hints, and an alluring floral aroma. A bold roast with hints of cocoa and toasted peanut. A dense texture that bites before a smooth finish. A bright and smooth roast, with floral and light caramel nuances. A clean texture. 100% Single Estate Raw Green Kona Coffee, dried and milled, ready to roast. This high quality (Extra-Prime and Prime) coffee is hand picked from our current growing season. The cherries are wet-processed, then the beans are dried and milled all within our Single Estate. Ideal for the home roaster. This coffee is intended to be roasted before consumption..
Our 100% Kona coffee comes in the following options: fine grind, drip grind, coarse grind, and whole bean. All of our packaged coffee at the café is whole bean, because it keeps fresh the best, but can be ground for you on-site. Buy your coffee fresh and in smaller quantities. While we recommend that you brew your coffee as soon as possible after purchase, we ship our coffee in sealed bags with oneway valves. Your coffee will stay fresh in the sealed bags for months if need be. Once you open the seal we recommend you try to use up your coffee within a few weeks. To store it in between brew cycles we recommend leaving the coffee in the bag it came in. Kona Coffee & Tea uses airtight, resealable bags that keep light and odor out. The bags have a one-way valve that allows freshly roasted coffee to “gas out” but prevents air from entering the bag. Simply roll down the lip of the bag, press out any excess air and seal the bag tightly when finished. Store the coffee in an area that is room temperature, dark, dry and scent-free. Do not store coffee in the freezer or fridge (condensation will build every time you remove and return the coffee) and do not store coffee near anything that has a strong scent. 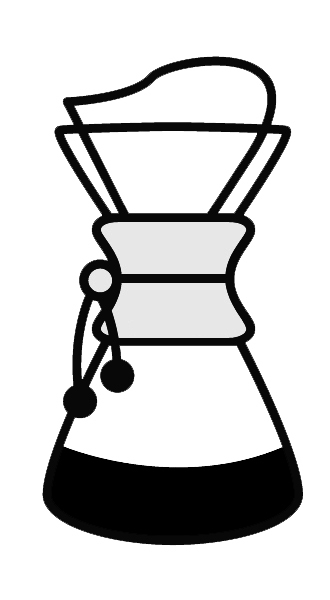 The French Press is an ideal brew method for those looking to get a full, bold extraction. Great for those mornings that require an extra kick. Stir gently 3-4 vigorous circles. Stir gently again then press slowly. Generally if the plunger is hard to press you will need a coarser grind. If the final cup is watery and bitter try a finer grind. This AeroPress method is one of our favorites. It is a great way to enjoy an immersion brew with less grounds and grit. Place plunger gently on the base. Just at the rim to form an airtight seal and prevent the coffee from leaking out. After 4-5 minutes carefully remove the plunger and stir well again. If the press is difficult to push try a slightly coarser grind. If the final cup tastes watered down and bitter try a finer grind. Chemex is our favorite pour over method. We recommend the bleached filters, as the unbleached filters leave a paper taste in the coffee that is difficult to prevent. Bloom, add about 100 grams of water pouring slowly from the middle out trying to saturate all the grounds. We like to give the grounds a gentle stir at this time to ensure even saturation. In a circular motion from the middle out, pour a fine stream of hot water over the grounds careful to avoid pouring directly onto the filter, about 250 grams at a time allowing the chemex to drain slightly in between pours until you have reached 630 grams of water. Bloom to the end of brew should take about 3.5-5 minutes. If the brew takes longer you need to use a coarser grind and if it brews too quickly try a finer grind. In comparison to it’s fast and furious cousin iced coffee, cold brew is a gentle giant of refined flavor. Where iced coffee is brewed hot, but stronger than normal to counter the dilution of the ice, Cold Brew is slowly cold-processed, giving it a gentle infusion of flavor with very low acidity. Combine 1 cup filtered water with 1 cup sugar in a pot and bring to boil, cool and use as a sweetener for your Cold Brew as desired. If you want some Cold Brew right now and can’t get to our Kona café, you can also use an AeroPress (see above) or Toddy Cold Brew System. We sell these and other brewing tools at our café.